Solid surface material like Corian® and Hi-Macs®, among others, is a great material to use for countertops, backsplashes, food preparation areas, hot and cold cafeteria areas, vanity tops, desks and worktables, windowsills and more. Given their adaptability, longevity, and durability, solid surfaces are easily cleaned and repaired, requiring little maintenance compared to alternative materials. Solid surface does not require exorbitant cleaning and maintenance. However, if they are misused, they can become damaged over time. We’ve outlines a few cleaning and maintenance tips that will help your solid surface retain its original, professional appearance indefinitely. Cleaning techniques can depend on the finish of your solid surface – matte (satin), semi-gloss, or high-gloss. All sinks and most countertops have a matte finish. If you’re not sure what your finish is, contact us and we’d be happy to identify it for you. As you clean your solid surface, you can use solid surface cleaners that are available at most home improvement centers. Ammonia-based cleaners and soapy water work well on all finishes to remove dirt and residue. For stains, you may need a stronger, more abrasive cleaner. Soap and water generally removes most surface stains and dirt. Cleaner with an ammonia-base (avoid window cleaner) works well on tough stains. After the surface is washed with soap and water, make sure all excess moisture is wiped away. To prevent a soap film or residue, make sure to dry the surface thoroughly after cleaning. Residue streaks can leave behind what looks like light scratches, but you can get rid of them by using a damp cloth with mild abrasive cleaner and rubbing it in small circles onto the surface. Wipe dry. Some common household substances like milk, whiskey, distilled water, vegetable oil, citric acid (10%), lye, household ammonia, iodine uid (10%), vinegar, pine oil, ketchup, naphtha, hydrogen peroxide (3%), household bleach, trisodium phosphate (5%), and isopropyl alcohol (90%) can be removed with water and a general kitchen cleaner. Crayon, lipstick, #2 pencil, coffee, mustard, and ethyl alcohol (90%) can be cleaned with a cleanser. We recommend cleaning permanent marker, black paste shoe polish, ball point pen, wet tea bag, acetone, and fingernail polish remover with cleanser and a Scotch-Brite® pad. Most common cleaners, including oxalic acid solutions, dilute hydrochloric acid solutions, and dilute trisodium phosphate solutions, won’t harm the finish of your solid surface. Powdered abrasive cleansers, ammonia, and strong detergents are all safe. Avoid acidic drain cleaner, toilet cleaner, and oven cleaner; these can cause whitening which is difficult to remove. If your solid surface is a fairly dark color, you can polish the surface with furniture polish to make it shine. Make sure you apply the polish according to the manufacturer’s instructions. If the surface is going to encounter food, Countertop Magic® is a safe option. Your solid surface is designed with an impact resistant surface, which enables it to endure harsh use without becoming chipped, cracked, or broken. If your solid surface countertops do exhibit stubborn stains, scratches, and tiny cuts, they can easily be repaired with a few simple techniques. If your surface has a matte/satin finish, we recommend a firm buffing with 220 grit sandpaper, followed with a Scotch-Brite® pad in little circles. If you have a semi-gloss surface, use 220 grit sandpaper first, then 320 grit, and then 400 grit. Apply an abrasive cleanser to a cloth and smooth the surface. A high-gloss finish must be restored by a professional. An orbital sander (attached with a vacuum dust collector) can eliminate deeper dents. First, use 120 grit sandpaper, then 180-220 grit. If you want a matte finish, use a Scotch-Brite® buffing pad in small circles. If you want a semi-gloss, continue using the orbital sander with 320 grit sandpaper, then 400 grit. Finish by buffing with a Scotch-Brite®. 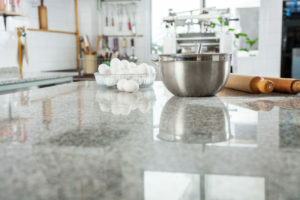 Some chemicals will damage your solid surface countertops. Avoid strong chlorinated solvents, ketones, methylene chloride (found in paint removers), chloroform, strong acids (i.e. concentrated sulfuric and hydrochloric acids), and acid drain cleaners. If these substances come in contact with your surface for even a short time, they can create stains or spots. Try washing stubborn stains thoroughly with water or full-strength bleach, just don’t let the bleach remain on your countertop for more than 5 minutes. If this doesn’t help, consider applying a buffing method mentioned above. Elongated exposure to these chemicals will require professional repair. Always exhibit common sense when using your solid surface. Don’t set hot dishes directly on the countertop; always use hot mats or trivets. During food prep, don’t cut directly on your solid surface; always use a cutting board. We don’t recommend using heat-generating cookware like crockpots and electric skillets on your countertop. If you have any questions about cleaning and maintaining your solid surfaces or are interested in professional architectural woodwork, we’d love to hear from you and see if our services will fit your needs. Contact us anytime and let’s schedule a time to meet. Note: Scotch-Brite® is a registered trademark of the 3M Company. Countertop Magic® is a registered trademark of Magic America Corp. Corian® is a registered trademark of DuPont. Hi-Macs® is registered trademarks of LG Hausys Europe GmbH.